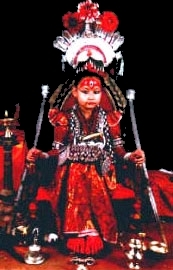 The Kumari, or virgin deity, is a Hindu cult practised in Nepal, and represents the reincarnation of Dea Taleju Bhawani, also known in India as Durga. 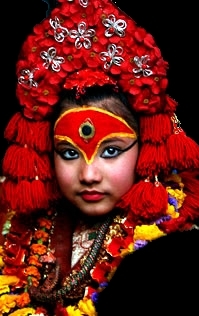 The Kumari are chosen among the Buddhist children of the Newar Shakya caste, resident in Kathmandu for at least three generations; the cast is the same one to which Buddha belonged. Even if chosen among Buddhists they are equally venerated by Hindus. During her annual feast, Kumari Jiatra, she is permitted to go out in public in a covered carriage. They are born mortal humans, members of the lower castes, but are then elevated to the realms of the living deities; forced to live in isolation from early childhood, without friends and deprived of an education, on their first menstruation or sign of illness they return human once more, have to drastically adapt themselves to the difficulties of everyday life. They are the Kumari, Hinduism’s living deities, who are now beginning to rebel against the “inhuman superstitions” who in Nepal, are forced to live a lonely single life, deprived of affection in the belief that anyone who marries them will die within a few months. This entry was posted on July 25, 2010 at 10:30 am and is filed under Godesses with tags azna, divine feminine, feminine god, gaia, Heavenly Mother, hindu, kumari, living, Mother Earth, Mother God, mythos, nepal, psyche, self help, shakinah, spiritual emergnce, Tara, yin yang. You can follow any responses to this entry through the RSS 2.0 feed. You can leave a response, or trackback from your own site. Feel bad for the young person. You’d think they would at least pay her way through the college of her choice and then some.